Why Should You Get a Marble Countertop for Your Kitchen? Your kitchen: You need to use it daily as you prepare your family’s meals. Your countertops: You need to use them as you prepare those meals. Cooking: It can do a number on your counters like nothing else can. Yes, your kitchen counters are just about the most useful installation within your home, but they are also, consequently, among the most ABUSED installations. They must bear the brunt of all the hot pant, sharp knives, and — grossest of all — raw meats that you’ll have to deal with as you feed yourself and your brood. And in time, all of this use and abuse can lead to decidedly worn-out countertops. More than that, with the raw meat, your countertops could become positively LADEN with bacteria! Neither situation is particularly good for maintaining a beautiful and, most of all, safe cooking environment. Of course, you CAN avoid these problems. And how is that? As anyone who’s ever bumped into a searing-hot pan can attest, your kitchen produces some SERIOUS heat. Pots, pans, and all else come off the stove top and out of the oven hot enough to cause some serious burns if you touch them wrong. And your countertops will bear the brunt of this heat every day. 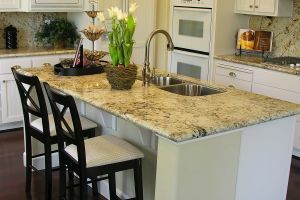 Over years, this hot exposure can do some serious damage to your countertops, requiring costly repairs and even replacements — but only if you have a countertop that’s susceptible to heat damage. With a marble countertop, though, you won’t have to worry about the heat. Why is that? Because marble is resistant to heat and heat-related damage, of course! If you want to handle all the cooking you’ll have to handle without dealing with the damages that heat can do, just have marble countertops installed! Your kitchen won’t produce only a substantial amount of heat. It will also produce more than its fair share of water. After all, you’ll boil, wash, rinse, and otherwise splash and slosh water about every day as you get your meals ready. And over time, that water can wear away at certain parts of your kitchen. Your tile can develop stains after enough years of drippage have worn away at them. And, of course, your countertops can become stained and even weakened through the years of liquid exposure. You can keep your countertops in quality condition while still using every gallon of water you’ll ever need for your culinary purposes. For that, all you have to do is get marble installed for your countertops! With its water-resistance, marble won’t get in the way of even the wettest cooking you’ll do! Your kitchen produces more than just heat and moisture. It also produces quite a good number of bacteria. Just look at what you’ll be dealing with in it: raw meat, sauces, flour, and all else. As all of these become exposed to your counter, they will spread and attract all manners of bacteria. Should your countertop be made of a material that easily takes in bacteria, you could be looking at some nasty health issues down the road. You might absentmindedly place a chicken on the counter once, and in that moment, you’ve infused that counter with salmonella germs — which can spread to your other food! You can avoid this nasty situation and the ensuing sickness by simply getting marble installed for your kitchen counters. Marble, especially when coated with a sealer, won’t take in bacteria, thus keeping your kitchen sanitary and your family safe through even the messiest recipes! Get Your Marble Provided By An Experienced Professional! If you think that marble sounds like the best product for your kitchen countertops, then you need to have it provided and cut by an experienced professional. And if you live in or around Hoboken, New Jersey, then that tile and marble expert should be none other than Kennedy Tile & Marble Inc.! We at Kennedy Tile & Marble Inc. have over thirty years of experience selling and cutting marble for countertops and other such purposes, so you can count on us to provide you with only quality materials!